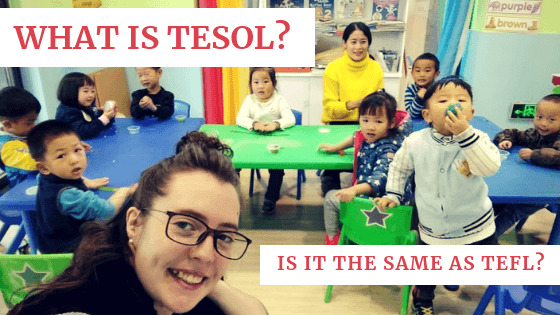 What Is TESOL? Which Certification Is Better–TEFL or TESOL? What Is TESOL? Is It the Same as TEFL? You’ve been doing your research into getting certified to teach English as a foreign language (TEFL) and you keep also running across the term TESOL. So, what is TESOL? Is the certification the same as TEFL, or is it different? The short answer is, although there is a subtle difference in meaning, the terms TEFL and TESOL are usually used interchangeably when it comes to certification in teaching English. Despite this common usage, however, there are actually differences in the meaning of these two terms. In this article, we’ll break down each acronym to explain those differences. We’ll also talk about TESOL requirements and other details of getting certified, such as cost, how long courses take, and whether TESOL certification expires. Is TEFL the same as TESOL? These two acronyms are umbrella terms for training courses offered online or in-person (or a blend of both) that prepare English language teachers. Although technically these terms have somewhat different meanings, when it comes to getting certified to teach English as a foreign language, or getting hired as a teacher, TEFL and TESOL used interchangeably. In fact, when you’re shopping around for TEFL courses, you may even see them described as “TEFL/TESOL courses.” Similarly, schools that hire teachers will make no distinction between the two. You might see an ad for a teaching job that requires “TEFL/TESOL certification,” for example. 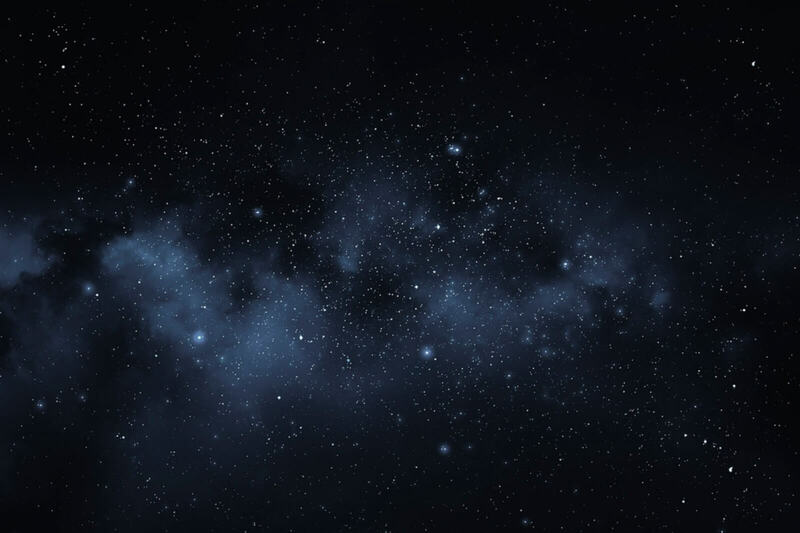 In the context of getting certified and applying to jobs, one is not better than the other; they are simply two terms commonly used to describe the same certification. Yet, despite the fact that the terms are used interchangeably by most TEFL providers and language schools, a deeper look at what these acronyms stand for will explain the subtle difference between TEFL and TESOL. TEFL stands for Teaching English as a Foreign Language. It refers to teaching English in a country where English is not a primary language (rather, it is a foreign language). An example of TEFL would be teaching English in China. TESOL stands for Teaching English to Speakers of Other Languages. Does that sound more general? It is. TESOL includes teaching English as a foreign language (such as in the China example) as well as teaching English as a second language (TESL), meaning teaching English in a country where the primary language is English. An example of TESL would be teaching English to language learners in the U.S. The important thing to keep in mind is that although there is technically a distinction between these two terms, they are widely used interchangeably, so either a TEFL or TESOL certificate will meet certification requirements for jobs teaching English. What is TESOL certification good for? TESOL certification, just like its equivalent, TEFL certification, is what you need if you plan to become an EFL or ESL instructor either in a traditional classroom or online. You’ll see this requirement listed in TEFL job postings for online teaching companies, English language schools, and other institutes around the world that hire English teachers. Usually a TEFL/ TESOL certificate of 100 hours is the minimum standard to qualify for these types of jobs. What are the requirements for TESOL certification? For most online or in-person TESOL courses, the only requirement to sign up is to have an English language level sufficient to succeed in the course. For non-native English speakers, the recommended level for certification usually ranges from a B1 to C2 CEFR level (CEFR is the Common European Framework of Reference, an internationally used standard for describing language ability level). Each TESOL/TEFL provider will have its own guidelines regarding the required English level, which can vary somewhat depending on the academic rigor of the course. 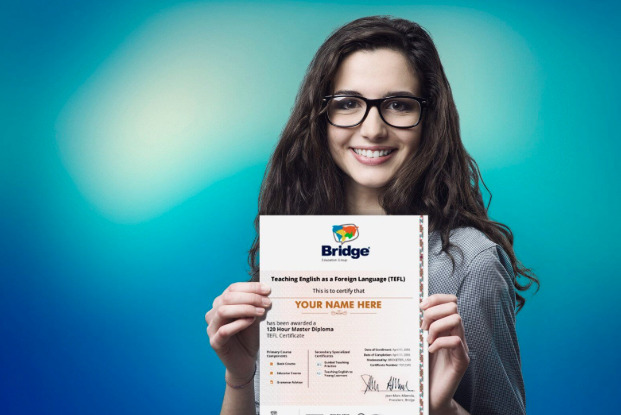 For example, Bridge has different English language requirements for our online TEFL courses (TEFLOnline and IDELT Online) than for our classroom-based courses. These guidelines are outlined below and can be found in our TEFL FAQs. Some TESOL programs are more advanced, or even university level (offering credit), and may, therefore, have additional requirements beyond language level, such as a minimum education level (high school or university diploma). How do I get TESOL certification? The most common way to get TESOL certification is to enroll in an online course. Online TESOL courses come in a range of hours, such as 40, 60, 100, 120, or 150 and usually provide the flexibility to complete coursework when it’s convenient for you. You can also take in-person TESOL course in a traditional classroom setting, either locally or in the country where you plan to teach. These courses are typically 4 weeks long and often follow an intensive, full-time schedule. How much does it cost to get a TESOL certificate? Cost of TEFL/TESOL certification courses varies depending on some different factors, such as whether you take an online or in-person course, the number of hours of certification if the course includes tutor interaction and the level of the course. You can expect to pay about $200 for very minimal online TESOL certification (about 40 hours) and closer to $400-500 USD for online certification of 100 hours or more. If you opt for university-level online training or a classroom-based TESOL course, the tuition can be substantially higher– usually between $1,000 to $2,500 USD. How long does it take to get a TESOL certificate? It usually takes between one to three months to complete a self-paced online TESOL course. This depends on the number of hours the course consists of (they can be anywhere from 40 to over 150 hours or more), and how much time you can dedicate to working on your course each week. Most people choose to take a TEFL/TESOL course of 120 hours, in order to qualify for the most teaching jobs, and this type would take about six weeks to complete, working on it part-time. Classroom-based TESOL courses, on the other hand, are almost always four weeks-long, since they are an intensive, full-time training. How long does TESOL certification last? TESOL certification does not expire; once you receive your certificate, it lasts a lifetime. Some teachers continue building on their initial certification in order to qualify for more jobs, by upgrading their course to add more hours of training or by earning a specialized TEFL/TESOL certificate in a high-demand teaching area, such as teaching English online or teaching young learners. TEFL and TESOL are common acronyms in the world of English language teaching and they are used interchangeably by most TEFL providers and language schools. Despite this common usage, it’s helpful for anyone entering the field of teaching English to speakers of other languages to have a clear understanding of what TESOL is, and the nuances between these two terms.